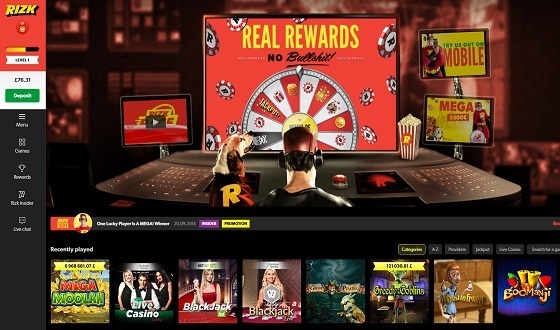 Rizk Casino Review - what's Rizk Casino got that the others haven't? Rizk goes out of the way to show you that it is no ordinary casino. They like to do things a little differently and this quirkiness is obvious from the moment you step through their virtual casino door and see their mascot, Captain Rizk, in all his superhero glory. Right away the Captain shows you to the centrepiece of the casino, the Wheel of Rizk, where we won 10 free spins without even having to deposit, although you can win significantly more than this on your first spin if you’re luckier than me. The first deposit bonus at Rizk casino is the highest you can currently find online, it’s a 200% match up bonus, the upper limit of what is available elsewhere. This is capped at £100, so if you deposit £50 they will give you £100 extra free, giving you £150 to play with. The wagering requirement for this bonus is 20x the bonus+deposit. It’s worth noting that you won’t qualify for this bonus if you deposit using Skrill or Neteller so make sure you choose a different method if you want to make use of this very generous bonus. You can always use Neteller or Skrill for your later deposits with no restrictions. Bonuses expire after 30 days and the maximum bet at any one time is £5. There are no caps in place in terms of how much you can withdraw from bonus winnings which is a welcome feature that other casinos would be wise to adopt. Depositing is very straightforward and there’s a top up option on permanent display at the bottom of the screen. Options are standard; Visa, Mastercard, Neteller, Skrill, Paysafecard and bank wire with all withdrawals processed instantly with the exception of credit card withdrawals and wires which take a day or two. More options would have been nice but this should be more than enough for most players. Rizk doesn’t hoard old games, everything is from the last few years which means that they have several hundred games available at any one time, with older titles being pruned and replaced with new ones every few days. 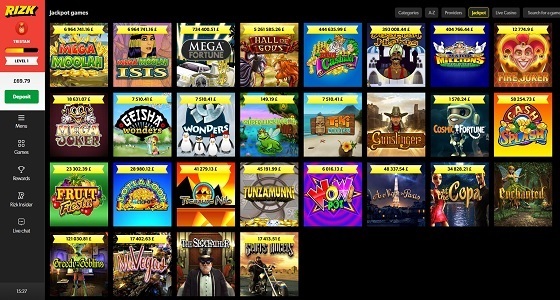 Net Ent, Play N Go, NYX, Microgaming, Quickspin and IGT are the main slot providers and we were delighted to see they also feature over thirty Betsoft slots. If you didn’t know, Betsoft make the most beautiful 3D slots currently available and are the most popular slot provider for players for whom aesthetics is just as important as gameplay features. 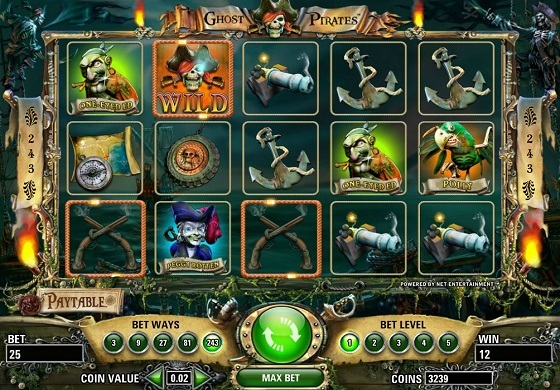 Gameplay was smooth throughout the review period and there was a real sense that the games were set on a high payout, we hit a nice win on Ghost Pirates which is another game with exceptionally good graphics for those aesthetes out there. Live casino dealers are provided by both Evolution and NetEnt which gives a good range of tables to choose from and some high stakes options. 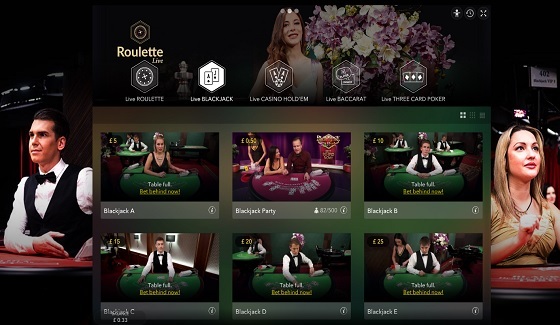 Roulette and blackjack are the most common live tables available but you will also find live casino holdem, live baccarat, live french roulette and live three card poker. The progressive slots options are seriously impressive. There are dozens of progressive jackpot games INCLUDING the multi-million pound progressive jackpot giants Mega Moolah AND Hall of Gods. Most of the other major progressives are featured here too such as Major Millions, Mega Fortune, King Cashalot and Arabian Nights. It’s always the sign of a good casino when they have lots of progressives as it indicates they are trusted by the big players in the industry to carry their jackpot prizes. Probably the ace in the pack of Rizk’s deck of goodies is their comprehensive promotions lineup. 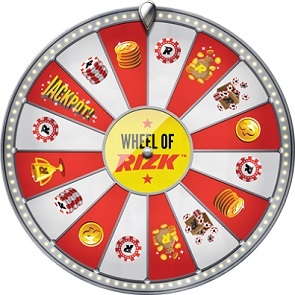 First up we saw the Wheel of Rizk which features everything from free spins to its very own progressive jackpot, you get a spin every time you fill up your Rizk Power Bar, a simple yellow bar that fills up whenever you make a bet. The other major promotional game is the Rizk Race, which features a real-time casino leaderboard with an impressive £7777 worth of prizes up for grabs at the end of the week. You gain points on the leaderboard by placing bets – watch out for double speed promotions and be sure to check your position on the leaderboard as entry is automatic. There’s also a Spin Exchange where you can trade in your free spins for higher value Super and Mega Spins which is a novel feature that we haven’t seen elsewhere, like many of Rizk’s promotions! There are many quirky promotions that are taking place throughout the week but there are also the standard perks you’d expect such as cashback offers, happy hours and randomly awarded free spins. One thing that really stood out was the customer care. Three times I used the live chat to ask various questions about the games and unlike some other casinos it took less than ten seconds each time to get a response. 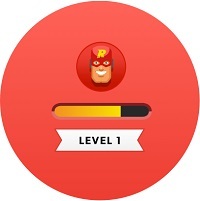 The chat support was knowledgeable and friendly with an obvious love for casino games. Nowhere is this attention to player care more obvious than in the long overdue Withdrawal Lock feature. Some casinos will take an age to process your withdrawal, hoping that you will grow impatient and transfer the funds back into the casino. None of that BS here. You have the option of placing a lock on your withdrawal once you have sent it for processing so you can get that big win and lock down the funds for withdrawal without any chance of you going back and losing it all. 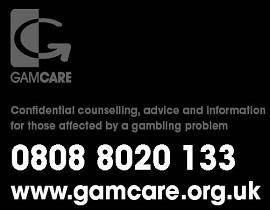 What a refreshing change this is and hopefully the start of a more caring gaming industry! Big players take note. The big theme at Rizk Casino is fun. Captain Rizk is an ironic character who doesn’t take himself too seriously and that attitude pervades the site. They know how to treat their players well though and you won’t find a better sign up bonus anywhere. If you love casino games but you’re up for a laugh and want some fantastic promotions to boot then Rizk is definitely the site you’ve been waiting for.